Riot with greenery and sculpted gardens, the Ringling’s 66-acres are a rich collection of tropical flora as inspiring as any work of art here. What is the Speakers Bureau Program? 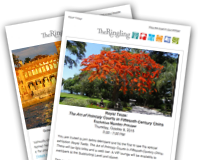 The Ringling Museum’s Speakers Bureau program strives to engage members of our regional community through abbreviated speaking engagements. Volunteer speakers and The Ringling staff experts strive to engage our community on a variety of topics about the Museum, its legacy and growth, its programming and its future. Who speaks on behalf of the Museum? A growing team of volunteer speakers have traditionally represented the Museum in our community. However, Curators and Educators from The Ringling Museum of Art, Circus Museum, Ca’ d’Zan, Art Library, Bayfront Gardens, and Historic Asolo Theater are available when the request is made several months in advance. The Museum’s Executive Director is also available upon special request. What types of presentations are offered? Typically, the Museum’s speaking programs are designed to engage new audiences with the varied offerings on the Estate. These audiences could be new seasonal or year-round residents to Sarasota and/or Manatee counties, but we have found that they are often long-time residents that have not taken advantage of the rich resource that is The State Art Museum of Florida. These introductory programs serve to inform and engage our community with the ever-changing Museum offerings. Special interest programs are also available highlighting our rich circus history, the legacy of John and Mable Ringling, the Art of Our Time contemporary visual and performance art initiative, the art and architecture of Ca’ d’Zan, the collections of the Museum of Art, and seasonal programs in the Historic Asolo Theater, among others.